Known as "Calla lily" which need lifting after they have flowered and before the frost. - Plant when danger of frost has passed and the soil has warmed. - Set bulb in moist but well drained soil. - Plant 5cm/2” deep and 15cm/6” apart. - They thrive in full sun, but will tolerate some shade. - Good in pots and containers. - When finished flowering allow foliage to die back and then lift the bulbs before the winter frosts. - Store in a dry, warm frost free location. - If left in pots over Winter, be sure the compost is left completely dry, and repot in fresh compost the following Spring. 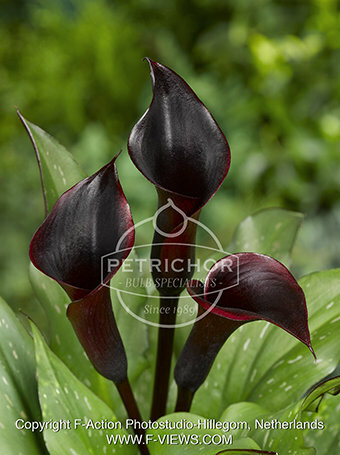 Please note: The only hardy variety of Zantedeschia and one that can stand wet conditions is the ‘Aethiopica’.